Centre half forward Elle Garret opened the scoring for Annaghdown on 3 minutes but her opposite number Amy Gannon levelled up matters four minutes later with a converted free and then edged her side ahead on 10 minutes with a confident finish after an incisive solo run. Elle Garret countered with a converted free of her own to tie up the match on the quarter hour mark. Three minutes later, Annaghdown full forward Eimear Mitchell took advantage of a defensive mix up in the Gráinne Mhaols full back line by scoring an opportunist goal. It was a real body blow for the westerners but their response to same was both immediate and emphatic. An Amy Gannon free on 19 minutes reduced the deficit to two points, and when the same player’s subsequent long range effort on 20 minutes dropped tantalisingly in front of the Annaghdown goal, corner forward Noreen Coyne was on hand to punch the ball to the back of the net. Gráinne Mhaols lead was short lived, however. Elle Garret linked well with wing forward Rachel O’Neill before slotting over the equaliser, and then Eimear Mitchell took the final pass from corner forward Leah Tunney before applying a cool finish. A superb point blank save by Gráinne Mhaols custodian Chloe Joyce two minutes before half time ensured that the prematch favourites lead by the bare minimum at the interval on a scoreline of 1-4 to 1-3. Two well executed points from the boot of Amy Gannon inside the first five minutes of the second half gave cailíní an iarthair renewed confidence, but not for the first time in this match, adversity was to bring out the best in Annaghdown and a quick fire brace courtesy of corner forwards Leah Tunney and Maloise Walsh restored their earlier one point advantage. There were now fifteen minutes to go and the match was on a knife edge. The turning point arrived on 37 minutes when Gráinne Mhaols spurned two gilt-edged goal chances inside sixty seconds. A searing solo run by Amy Gannon through the heart of the Annaghdown rearguard saw her bear down on goal, only to be correctly pulled for overcarrying. From the resultant free kick, wing forward Gráinne King secured possession and duly picked out Noreen Coyne with perceptive pass. The latter deftly turned her marker but Annaghdown keeper Aoife Fahy narrowed the angle superbly and the resultant shot flashed the wrong side of the post and into the side netting. These costly misses represented a huge let off and a serious wake up call for the Corribsiders and they took full advantage shortly afterwards when Rachel O’Neill fired home the all important second goal on 42 minutes to extend her side’s lead to 2-6 to 1-5. Annaghdown never looked back thereafter and outscored their opponents by 0-4 to 0-2 in the eight minutes that remained. Elle Garret and Eimear Mitchell shared these crucial scores between them with the latter also spurning two clear goal chances. Gráinne Mhaols responded with two excellent efforts from centre half back Kaytlyn Lee who had been switched to midfield after the concession of the second goal. Annaghdown’s well deserved victory means that they will now participate in the 2015 U14 Division One Championship and League. While their forward unit showed very high skill levels and great cohesion all through, it was the performances of corner back Deirdre Hughes and full back Eimear Glynn that really caught this writer’s eye. Gráinne Mhaols can be well proud of their contribution to what was a free flowing and very entertaining spectacle and there were some fine individual performances from a number of their players, notably, full backs Caitlin Lee and Katie Flaherty, wing backs Sorcha O’Malley and Ciara McDermott, midfielders Róisín Mannion and Megan Walsh, and the aforementioned Kaytlyn Lee and Amy Gannon. Well done also to Bearna referee, Katy Kilbane who was fit, fair and firmly in control from start to finish. Post Script: Gráinne Mhaols U12s captured the Pirate Queen Cup for the first time ever when they defeated Westport by 3-4 to 2-0 in Westport on October 9th last. The other results in this Round Robin Tournament were as follows: Westport 3-6, Louisburg 2-5 and Gráinne Mhaols 3-8, Louisburg 3-8. Gráinne Mhaols U14s defeated Naomh Anna Leitir Móir by 5-15 to 2-0 and drew with Clonbur on a score line of 1-7 to 1-7 in the County Division 3 Championship. They play Clonbur in a Playoff in Moycullen on Monday, October 28th with the winners progressing to the County Final. At the time of writing, Gráinne Mhaols U16s have upcoming County Division 4 Championship matches to play against St. Michaels (home) and Bearna (away). 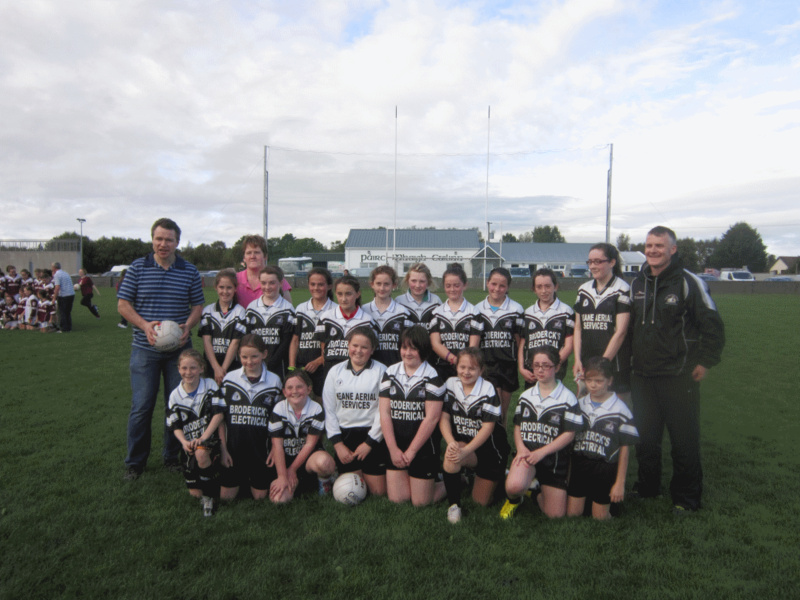 This entry was posted in News, Sports News and tagged Annaghdown, Gráinne Mhaols, U12. Bookmark the permalink.